Bruce's Campbell Horror Film Festival! Rosemont, IL – July 31, 2014 – Philadelphia’s The Awesome Fest, in partnership with Wizard World Inc. and horror icon Bruce Campbell, announced today the first ever Bruce Campbell Horror Film Festival, running August 21-24, 2014 in Rosemont, IL. The four-day event will coincide with Wizard World Chicago Comic Con and will feature the best in independent horror cinema with a full slate of film premieres, panels, special guests, movie marathons, and of course, Bruce Campbell! The festival will take place at the Donald E. Stephens Convention Center in Rosemont, the Muvico Rosemont, and inside the Dome at Rosemont Ballpark. Tickets for ALL screenings are free to attend with admission to Wizard World Chicago Comic Con. A limited number of festival badges, with exclusive access to the screenings, are on sale now for only $50. Badges for the festival can be purchased through www.theawesomefest.com & www.wizardworld.com. The direct link to the ticketing page can be found here: http://wizardworld.ticketleap.com/awesomefest. Early next year, March 6-8, 2015, Bruce Campbell will return to Chicago to emcee his recently announced Horror Fest, also presented by Wizard World Chicago. Fans can expect to see some of their favorite genre stars, directors and writes from great television shows, movies, graphic novels, and comics. An action-packed horror/comedy in which a group of college kids staying at a riverside cabin are menaced by a swarm of deadly zombie beavers. Yes, really. That’s the plot! A dark look into the minds of two men with nothing in common: Nomura, a self-obsessed serial killer residing in Tokyo and Bayu, a failing journalist who lives in Jakarta. Connected through a series violent incidents, both men inexplicably start to feed off each other. (Not literally). Co-directors “The Mo Brothers” (Macabre, V/H/S/2) deliver an epic tale that works as action, suspense, and disturbing horror at the same time.. Written by Mike Hostench (Deputy Director of Sitges Film Festival), Asmodexia documents five days in the lives of an exorcist and his granddaughter working in the Barcelona area. If you think you’ve seen every exorcism angle imaginable, prepare to be surprised. And a little grossed out. Raymond can channel the paranormal, but he’s afraid of chatting with a cute girl.. Kicked out of his big city apartment, Raymond returns home to his overbearing mother, ex-jock father, and beer-bellied classmates. But when a vengeful ghost terrorizes the small town, Ray recruits Becca, a badass local bartender, to help solve the mystery. From the director of the admirably strange Excision, and starring Matthew Gray Gubler, Ray Wise, and Kat Dennings. A hopeful young starlet uncovers the ominous origins of the Hollywood elite and enters into a deadly agreement in exchange for fame and fortune. From the producer of Cheap Thrills and Jodorowsky’s Dune, Dennis Widmyer & Kevin Kolsch’s Starry Eyes is an occult tale of ambition, possession, and the true cost of fame. Leading lady Alex Essoe is an absolute revelation, but there’s a lot for horror fans to get behind here. A group of friends on a weekend trip to a cabin in the woods find themselves terrorized by alien visitors, who promptly chase everyone all over the place. So it’s a slasher movie, a suspense thriller, and a pretty gruesome alien abduction tale all at once. Plus it’s got some solid humor and an amazing final shot. From the directors of the found footage horror flick Grave Encounters. Oh, also Michael Ironside pops up! If the worst day of your life consisted of accidentally killing your girlfriend with an axe, chain-sawing your own arm off, and watching in horror as your closest friends were devoured by a zombified Nazi battalion, you'd have to assume that things couldn't get much worse. In Martin's case, that was only the beginning. From the director of Hansel & Gretel: Witch Hunters and (of course) Dead Snow. While video chatting one night, six high school friends receive a Skype message from a classmate who killed herself exactly one year ago. A first they think it's a prank, but when the girl starts revealing the friends' darkest secrets, they realize they are dealing with something out of this world, something that wants them dead. Told entirely from a young girl's computer desktop, Cybernatural redefines 'found footage' for a new generation of teens. From producer Timur Bekmambetov (Night Watch, Wanted). Inner Demons follows an 'Intervention'-style reality show crew that films an episode about a sixteen-year old girl, a former A-student, who is fighting addiction but may in fact be suffering from something even more destructive: demonic possession. Director Seth Grossman was a producer on A&E’s award winning series “Intervention,” which certainly lends an air of authenticity to a gradually more unpredictable horror story. After several years of sexual dysfunction, Ada and her boyfriend, Calvin travel to her hometown in rural Oklahoma in the hopes of piecing together her fragmented childhood memories. They find their answers, but can they find their way back home? Starring WWE’s Goldust & DC Comic’s Jill Thompson. 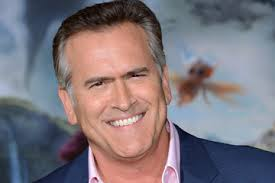 Best known for his roles on the big screen in cult classics Army of Darkness and Evil Dead, as well as his role as Sam Axe in the hit TV series Burn Notice, Bruce Campbell has proven to be a force to be reckoned with as an actor, director, and author. Don’t miss your chance to ask him your most interesting questions as he makes an appearance at Wizard World Chicago Comic Con. You’ve almost definitely seen the Evil Dead movies before, but we guarantee you’ve never seen them like this! Join us under The Dome at Rosemont Ballpark as we screen the original entire Evil Dead trilogy on a giant 30 foot movie screen. Special surprises, and guests TBA. This marathon is completely FREE for all to attend! Panel discussion and Q&A with film critics Steve “Capone” Prokopy (Ain’t It Cool News), Erik “The Movieman” Childress (Chicago Film Critics Association), & Scott Weinberg (FEARnet, The Horror Show). Special guest filmmakers will also be joining the panel!.